If a history book were published about Palm Coast and its people, an exciting and fulfilling chapter would be written about the year 1978. Firm roots were planted by ITT Community Development Corporation ( ICDC) as the headquarters building opened, fulfilling a commitment to consolildate offices from New York, Miami and Palm Coast. The facility and personnel presence in Palm Coast highlight the p0int that ICDC continued taking direct involvement in Palm Coast in developing a planned and controlled community where families can live, work and play. Now in the final stages is another key development. The Palm Coast Shopping Center with Publix and Eckerds will offer one stop shppping facilities in fashionable and attractive surroundings. We are happy that golf sensation Nancy Lopez has chosen Palm Coast as here official place of residence, and is the touring pro for Palm Coast Golf Club. As we approach the 3,000 population mark in this water-oriented community, we have become the "home-Port" for Nancy's Navy. Arnie's Army likewise had an enthusiastic showing here as Arnold Palmer played our golf course after signing a contract to design Palm Coast's second golf course which will be completed by December 32, 1980. A further expansion was made in our tennis activities with the opening of six lighted cushionized tennis courts. The Palm Coast Community YMCA has soared with interest and participation. Memberships and individual donations have assisted the programs and activities conducted for youngsters and adults living throughout the county. Houses of worship likewise have made significant and lasting strides in the community. Services are being held in the St. Mark by the Sea Lutheran Chuirch and the First Baptist Church of Palm Coast. Clergy and parishioners of Mother Seton Catholic Church broke ground in September for a church on the newly opened Belle Terre Parkway. The new church will be completed in April or early May. In providing support services to the growing community, expansions are being made on the wastewater treatment plant which will be completed in February and the water treatment plant to be completed this spring. Palm Coast Utility Corporation has relocated from a model home near the Welcome Center into new offices off of Old King's Road. New rates, fees and charges were placed in effect on January 1, 1979. These adjustments represent the first overall revision of rates by the Utility since 1971. Due to inflation and increased construction costs, the contribution-in-aid -construction for water has been established in the amount of $640. or $810 depending on Section. The water tap, meter installation and connection fees will range between $255. and $320. For new homesite purchasers who do not connect to the system, there will be an assessed availability fee of $4.00 per month for both water and sewer service. In the area of residential lot improvement, all improvements including central sewer failities scheduled to be completed by the end of the year, were completed on time. A second fire truck was loaned by ICDC to the Palm Coast Fire District and the volunteer Fire Department. Our own Palm Coast Construction Company has entered the residential market and is adding final touches to prototype models. The Sheraton Palm Coast Resort Inn received awards of excellence at the Sheraton World Conference held in Boston in September. Headlining the Spring Festival was Archie Campbell, of television's Hee Haw fame. This six-day celebration was highlighted with and international bathtub boat race, the Italian American Festa, a four-mile foot race, band concerts, fireworks, tennis and golf tournaments. The year was not all fun and games. Research and hours of hard work were poured into a four-year effort as the Comprehensive Land Use Plan (CLUP) was completed. Working directly with state planning agencies and receiving valuable input from outside consultants, the ICDD planning staff has readied a plan which provides a working framework describing the locations of future residential units, parts, roads, recreational areas, industrial property and commercial stores. The above from: ITT Community Development Corporation, Exective Offices, Palm Coast, Florida 32051 Telephone (904)445-2628. It seems every year gets better at Palm Coast and 1979 was a year of solid accomplishment. A brief look at the year in retrospect will explain why I feel that way. Early last year Palm Coast Shopping Center saw five businesses open and in April, Publix Supermarket held its grand opening. Today there are 17 tenants in the shopping center, with more on the way. The East Flagler Service District was activated in April. This was a giant step towards Palm Coast having one uniform governmental entity. The Palm Coast Industrial Park gained a new tenant with the decision by the Wittemann Company of Buffalo, New York, to relocate here. We also began construction of a 25,000 square foot building shell, which we will finish to suit a tenant, and thus provide a competitive delivery date for new industry. A new ITT subsidiary ITT Transportation Distribution Service Center, established its headquarters in Palm Coast. Another busy element was the religious sector of Palm Coast. The Mother Seton Catholic Church was dedicated in May. Temple Beth Shalom is under construction and the United Presbyterians and United Methodists are both planning to build houses of worship. The 200 member Italian American Club held its annual Festa in the Spring, and the club purchased an acre of land where the clubhouse will eventually be built. The amenities in Palm Coast continue to expand with the new Swim and Racquest Club completed in December 1979, the expansion of the Marina facilities nearing completion , and our second 18 hole golf course, which was designed by Armond Palmer and Ed Seay, is under construction and due for completion by the end of December 1980. Sepaking of golf, Nancy Lopez has continued to represent Palm Coast well by leading the LPGA in wins. Nancy will also purchase one of the new Fairways Condominiums nearing completion , along the 17th Fairway. The capacities of the water treatment plant and the wastewater treatment plant were expanded last year. The water plant tripled its capacity and the wastewater plant doubled its capacity. Not only de we have good water in Palm Coast, but the water service we provide had a direct bearing on the reduction of fire insurance rates for residents of the Palm Coast Fire District - a savings for everyone in the District. Another highlight last year was the opening of Daytona Beach Community College Flagler Center in the Palm Coast Shopping Center. With nearly 400 students from all parts of the Country, the center has already outgrown its facilities and may soon be expanding to a second building in the shopping center. Continuing in education, ICDC again last year awarded a 1,000 scholarship to a Flagler Palm Coast High School graduating senior. A middle school has been recommended by the State, and ICDC has donated 20 acres of land to the School Board for the school site with an option to purchase an additional 10 acres if needed. Our postal service grew again last year. The new Palm Coast Post Office opened in March and began home delivery service in November. Construction of new homes was brisk last year, nearing the 300 mark. Our new model home center opened in the Woodlands featuring homes by Palm Coast Construction Company, Brattlof Construction Company and Red Carpet Development. The models are open in our new 200 unit condominium being constructed along the 16th and 17th golf course fairways, and units are available for sale in the states where we are registered. After many months of planning the I-95 interchange moved closer to reality. Constuction should begin by early 1980. Tournaments were much in evidence last year. First, The Nancy Lopez Pro-Am was held in February, followed by the Florida PGA Tournament of Champions . In June, The Colgate/PalmCoast World Mixed Team Championship was won be Lee Trevino and Nancy Lopez. The Michelob Light/Palm Coast Pro-Am Tennis Championships were played at our tennis complex. Out Touring pro Tom Gullikson, who is building a new home in Palm Coast played an exciting exhibition match with another outstanding pro Marty Riesssen. Approximately 6,000 homesites were completed by the end of 1979. In addition to all committed improvements, these homesites have central sewer facilities. the Fariways condominium complex to a total of 200 units. opeing last Spring, and now hosts many swim meets throughout the year. and volley ball leagues, parades, dances and parties. The 3.6 million Palm Coast Parkway/I-95 interchange - funded more than 95 percent by ITT Community Developoment Corporation (ICDC) was christened in May by Florida Lt. Governor Wayne Mixson, who called the project a "artenership between private industry and government." ICDC planners perdict the interchange will create many opportunities for commercial and industrial growth in the community. With this in mind, ICDC opened Palm Coast Industrial Park west of U.S. 1 in November. The Park with 32 acres in its first phase - offers smaller businesses a lower cost alternative to the Pine Lakes Commerce/Industrial Park. Due to begin production early in 1982 in the new park is Olde St. Augustine Ovens, Inc. manufacturers of all-natural cookies and other healthporiented baking products. Another company to begin operations in 1982 is Cardiac Control Systems, Inc., a cardiac pacemaker firm. Cardian Control initially will employ 70 persons in its 25,000 square foot facility in the Pine Lakes park, and could employ up to 1,000 people within 5 or 6 years, according to its management at this time. Negotiations for facilities in the parks are continuing with several other companies. Tenants in The Atrium, the first professional office building in Palm Coast, began doing business in their new offices in Janary. Next door, the Realty World Complex, which includes a branch office of Centruy Federal Savings and Loan, opened for business in November, Barnett Bank's branch office near the shopping center is scheduled for completion in January; Florida Federal Savings and Loan's branch nearby is scheduled for completion in March and Security First Federal Savings and Loan in the Palm Harbor Shopping Center completed expansion of its facility in November. Palm Cable, Inc., continued its expansion program in 1981, with service now available to more than 1,7000 Palm Coast homes. Also, the Entertainment and Sports Network (ESPN) was added to the basic subscriber package, joining pay channels HBO and Cinemas, Atlanta's superstation Channel 17 and eight other channels. Palm Coast's water and wastewater treatment plants are undergoing expansion and are expected to be completed next summer, the water treatment plant won its second consecutive state award for operational excellence. The Florida Public Service Commission - which regulates Palm Coast Utility Corporation (PCUC)- authorized PCUC in December to increase the sewer fee to $1,342 for all sections of Palm Coast. The increase will be in effect in 1982. A Palm Coast substation of the Flagler County Sheriff's Department opened in October, manned by full-time deputies and Palm Coast volunteers. The Belle Terre Middle School, being built on 30 acres of land donated by ICDC is progressing toward a Fall, 1982 opening. Coquina Lanes, a new 20-lane bowling center, opened in August. A little further north on Old Kings Road is the spacious clubhouse of the Italian-American Club, completed last spring. The former Palm Coast Yacht Club reopened in March as The Harbour Restaurant with beautifully renovated interior and new menu selections. The Pine Lakes Country Club restaurant began serving gourmet dinners and lunches to members in the fall. Also the Palm Harbor Tennis Club has been enlarged and improved withe the addition of a lounge and restroom/locker building, and the 19th Hole at the Palm Harbor Golf Club was enlarged and renovated as well. Special events staged this year were huge successes. The Internation Festival in October drew more than 10,000 visitors to Palm Coast. The Italian Festa in May, Mother Seton Catholic Chursh's Oktoberfest, the Palm Coast Civic Association's July 4th celebration and Entertainment '81 concert series, plus special events staged by the YMCA and other organizations made thie year's social calendar a busy and entertaining one. Meanwhile, ICDC continued its diversification of housing product lines, with the opening of Pine Lakes Village, a new country club community of luxury single family and condominium homes west of I-95. The 1.8 million Pine Lakes Country Club clubhouse, local point of Pine Lakes Village, was christened in August by Arnold Palmer, co-designer of the 7,066 - yard Pine Lakes course. The Woodlands Model Home Center featuring six new single family homes designs, opened in early summer almost simultaneously with the first 20 units of the Woodhaven Condominium on Old Kings Road. Two other new Palm Coast Construction Company model homes - the Sandpebble and Westwind - opened in January on canal lots directly across from the Welcome Center. In other residential news, land development of residential lots - i.e., roads, central sewer and water lines - was completed ahead of schedule in all sections of Palm Coast that had an Improvement Completion Date of December 31, 1981. Similarly, we expect all other previously committed residential land development in Palm Coast to be completed ahead of schedule. 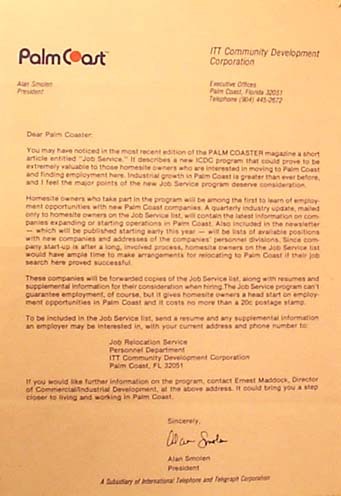 You may have noticed in the most recent edition of the PALM COASTER magazine a short article entitled 'Job Service.' It describes a new ICDC program that could prove to be extremely valuable to those homesite owners who are interested in moving to Palm Coast and finding emloyment here, Industrial growth in Palm Coast is greater than ever before, and I feel the major points of the new Job Service program deserve consideration. Homesite owners who take part in the program will be smong the first to learn of employment opportunities with new Palm Coast companies. A quarterly industry update, mailed only to homesite owners on the Job Service list, will contain the latest information on companies expanding or starting operations in Palm Coast. Also included in the newsletter - which will be published starting early this year - will be lists of available positions with new companies and addresses of the companies' personnel divisions. Since company start-up is after a long, involved process, homesite owners on the Job Service list would have ample time to make arrangements for relocating to Palm Coast if their job serach here proved successful. These companies will be forwarded copies of the Job Srvice list, along with resumes and supplemental information for their consideration when hiring. The Job Service program can't guarantee employment of course, but it gives homesite owners a head start on employment opportunities in Palm Coasat and it costs no more than a 20c postage stamp. If you would like further invormation o the program, contact Ernest Maddock, Director of Commercial / Industrial Development , at the above address. It could bring you a step closer to lilving and working in Palm Coast. Sincerely Alan Smolen, President. We remain Stewards of this information, expecially Dr. J. Norman Young era inforamtion, hoping for a Museum like Flagler Beach already has.